If you think major league baseball road trips are boring, think again. The super-sly and incredibly clever Tampa Bay Rays manager Joe Maddon keeps his team loose by incorporating a few themed trips every season. The ever-inventive Maddon had his team dress in Western wear and hockey jerseys, just to name a few. USA Today reports that Maddon one-upped himself for the Rays just-concluded crazy cross-country trip from St. Petersburg, to Seattle, to Anaheim, to Baltimore, then Detroit before finally returning home to Florida. The Rays’ traveling party sported a grunge look on the way to Seattle, a Beach Boys theme into Anaheim and pajamas for the overnight flight to Baltimore. There was no Detroit theme because it was a makeup and Maddon had the players wear caps and shirts representing automakers on the previous stop in the Motor City. It must have worked because despite the tortuous schedule, the Rays finished 6-5 on the trip. In the video, Rays shortstop Reid Brignac talks about his big game last Wednesday and then shows off his pajamas. 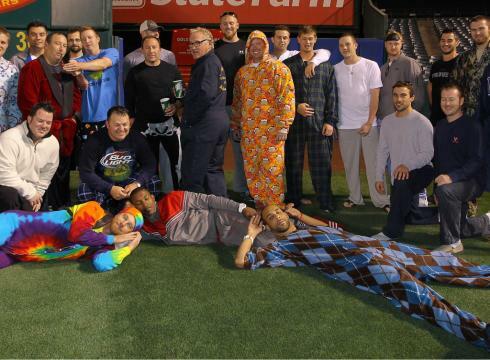 As pictured above, pitcher David Price’s swanky argyle one-piece outfit and second basement Ben Zobrist’s tie-dye number were among the highlights as the traveling party got dressed after a night getaway game in Anaheim and wore their outfits as they checked in for the red-eye to Baltimore. After a tough loss to the Tigers Monday night in the make-up game, the Rays begin a big series with red-hot division-rivals Boston Red Sox, winners of their past nine as they have stormed to the AL East lead. This entry was posted in Baltimore Orioles, Detroit Tigers, Hazing, LOL, Los Angeles Angels, Seattle Mariners, Tampa Bay Rays, Uncategorized and tagged Baltimore Orioles, Baseball, Boston Red Sox, David Price, Detroit Tigers, Funny Video, Joe Maddon, LOL, Los Angeles Angels, Major League Baseball, MLB, Reid Brignac, Roadtrip, Seattle Mariners, Tampa Bay Rays. Bookmark the permalink.